NEW YORK -- A New York City deer that was first slated to be humanely euthanized and then spared to be relocated has died while awaiting the trip upstate, CBS New York reports. City officials said Friday that the deer, which had only one antler, died as a result of being under a lot of stress while in captivity. The buck drew crowds for about two weeks at Jackie Robinson Park in Harlem, where it was known to residents either as J.R. or as Lefty for its missing left antler. The deer’s death came after the city said despite its concerns that it would be handing over the deer to the state Department of Environmental Conservation to be relocated upstate. The city and the state had been at odds over the fate of the white-tailed deer since it was caught Thursday near West 155th Street. It had wandered out of the Jackie Robinson Park. “Moving the deer to a new place would likely have caused the animal a great deal of suffering and would have been inhumane on many levels,” she said in a statement. He said they were working on securing a safe transport for the animal to a “suitable habitat upstate” in partnership with the federal Department of Agriculture’s Animal and Plant Health Inspection Unit. “We offered yesterday to take possession of the deer and transport it to a suitable habitat. The City did not accept our offer until just before noon, and while we were arriving on scene the deer died in the City’s possession,” Mahar said in a statement Friday. Gov. Andrew Cuomo on Thursday had directed the DEC to offer assistance to the city in relocating the animal to a new habitat. 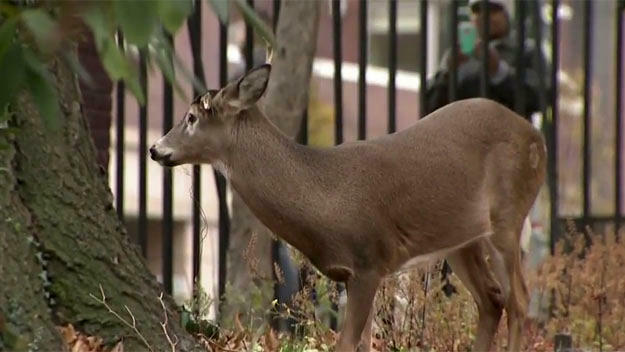 Some residents in Harlem were upset about the possibility of the deer being put down.